What is Cinemalaya DAY PASS tickets? Select any day from July 27 to August 3 and watch 5 film screenings on that same day. You will get 1 ticket each for 10AM, 12:45PM, 3:30PM, 6:15PM and 9PM. TriNoma, Greenbelt 3 and Alabang Town Center. Hotel, and Alessandra De Rossi of Gil M. Portes’ Liars. Jerrold Tarog’s Sana Dati with Paulo Avelino, who also leads Debosyon. has his Rekorder and O’Hara has his The Houseband’s Wife. This year, Cinemalaya offers a full slate of 25 films in its three competition categories. Directors Showcase is a competition for works by established directors. We are excited, see you there on Sunday, July 28, 2013! 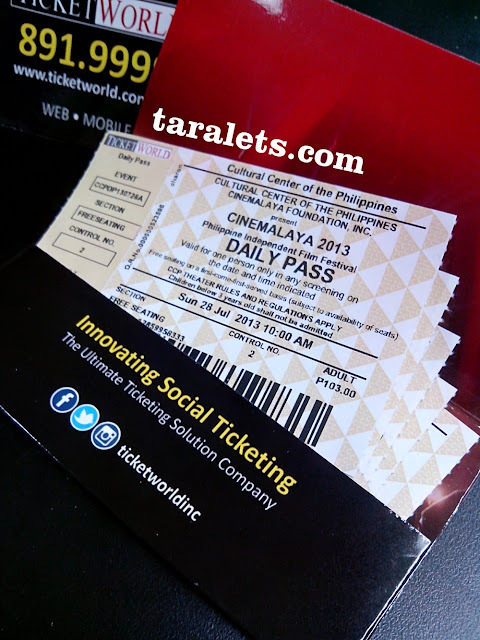 Uh... just noticed, we've purchased the first print of Cinemalaya 2013 Day-Pass Tickets (of 5). As said on the control number... not too excited huh.. scared of sold-out... maybe! hahahaha.